The former Democratic congressman and U.S. Senate candidate avoided talking about 2020 on Monday — but it was virtually unavoidable as he starred in a split-screen night with President Donald Trump. EL PASO — Beto O'Rourke didn't utter a word about 2020 here Monday night, but he didn't have to. Acknowledgment or not, O'Rourke's leading role in his hometown's response to President Donald Trump's visit magnified the spotlight on him as a potential 2020 presidential candidate, providing a split screen with the incumbent he could end up facing. The contrast was vivid as O'Rourke led a dueling march and rally — steps away from the site of Trump's rally and at about the same time — and it left his supporters convinced the former congressman and U.S. Senate candidate is readier than ever for the national stage. 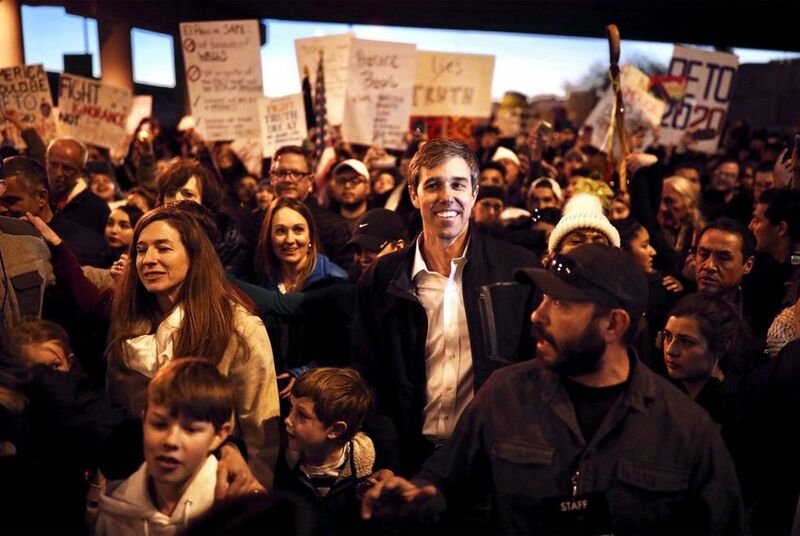 "He's an El Pasoan before anything, and today just basically shows us — and the nation — what he's willing to do, and I don't think it stops here," said Carlos Dobler, a 24-year-old college student, as he left O'Rourke's rally with a group of people that included at least one "Beto 2020" sign. "I don't think it stops at the border. It keeps going for him." O'Rourke fueled 2020 speculation anew a week ago when he revealed in an interview with media mogul Oprah Winfrey that he will decide on a presidential campaign by the end of the month. But on Monday, O'Rourke studiously avoiding playing into the 2020 hype, responding to reporters' questions about the White House race by shifting attention to El Paso coming together to push back against Trump's misinformation about the city. “Let’s stay focused on where we are right now in 2019, a great opportunity for El Paso to tell its story," O'Rourke told The Texas Tribune when asked what he would tell supporters who chanted things like "run, Beto, run" throughout Monday night. "And you know what? The president did us a favor. The attention he’s brought to his community, the lies that he’s told, beg for a response, and this community’s providing it. It’s powerful, it’s honest, it’s peaceful and it’s one of the most beautiful things I’ve ever seen." On a conference call hours before the rally, O'Rourke was similarly disinterested in stoking 2020 buzz. Asked if he felt the president was personally challenging him by holding his rally in El Paso, O'Rourke said he did not and argued Trump was "here in an effort to use this community as a prop to make his case for the border wall." Asked if the event struck him as prelude to a run for higher office, O'Rourke said it did not. "I'm gonna follow the community's lead," O'Rourke said, "and that's what for me tonight is all about, nothing less and nothing more." Despite O'Rourke's coyness, signs of his potential White House candidacy abounded. During the march, there seemed to be as many chants about him and 2020 as there were about Trump and the border wall. Outside the park where O'Rourke spoke, attendees could buy shirts, pins and hats bearing a 2020 campaign logo. And along the way, supporters toted signs with variations of "Beto 2020," some improvised based off his 2018 yard signs. Trump and Texas Republicans sought to use the night to blow up O'Rourke's 2020 ambitions on the runway, seizing on varied crowd size estimates to argue he could not draw a bigger turnout than the president in his hometown. "I would say that may be the end of his presidential bid," Trump said inside his rally, where he incorrectly told the crowd that O'Rourke had attracted 200 or 300 people to his event. Regardless of the crowds, there was ample evidence Monday night that O'Rourke's political career — or star power — had not significantly faded. Never too far from him was a group of former aides from his Senate campaign, and he was also trailed by Annie Leibovitz, the world-famous photographer, not to mention a phalanx of other national media. In a sign of O'Rourke's stature here, the other Texas Democrat in the 2020 conversation — Julián Castro, already a candidate — did not try to compete for the spotlight in El Paso, instead releasing a video set in another border city, Eagle Pass. Speaking in front of the border crossing where his grandmother came to Texas in 1922, Castro predicted Trump would "create a circus of fear and paranoia" at his El Paso rally, adding to viewers, "Don't take the bait." He was scheduled to appear on CNN during Trump's rally. Yet for now, O'Rourke draws far more intense interest in Texas and nationally — so much so that at least one early voting state activist, Jay Surdukowski, made the trip to El Paso to see the O'Rourke phenomenon in person Monday. Surdukowski, a New Hampshire attorney who co-chaired Martin O'Malley's 2016 campaign in the state, recently hosted an event at his home for one of the groups seeking to draft O'Rourke into the race. "He's the real deal," Surdukowski said moments after O'Rourke finished speaking Monday night. "You really have to be here in person." Surdukowski added, "I think in New Hampshire he would be extraordinarily well-received. I don't know what venue we'd be able to put him in because he'll just draw huge crowds." For now, O'Rourke fans will have to wait a little longer for his 2020 decision, and while the Oprah interview gave them fresh hope, O'Rourke did not build on it with any new clues Monday night. In fact, he signed off his speech with a line similar to the one at the end of his election night speech in November. This time, there may have been more urgency to it. "We'll see ya out there," O'Rourke said.